were offered to their customers. 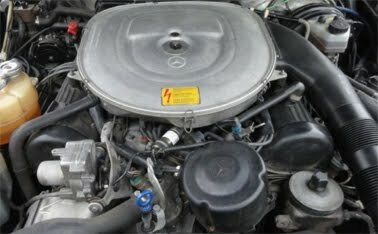 potent 245hp Mercedes V8 5.0 ltr, often combined with Schuler transmission and transfer solution. 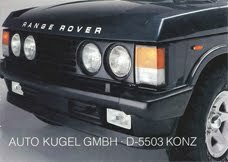 The long 3 axle extended Range Rover conversion was TÜV-approved in Germany. 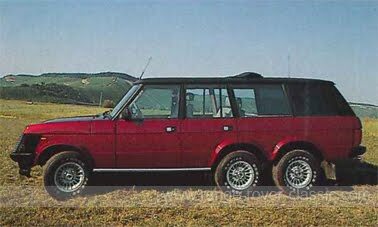 of the Range Rover to convertible was delivered from the german converter Con-Moda. 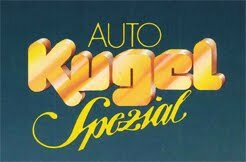 Finishing with right engine, transmission and interior was done by Auto Kugel. developed products is structured so that each accessory independently can be installed. 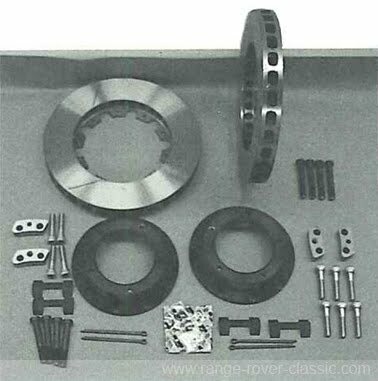 A special section of this catalog includes accessories that you can install on the Range Rover, by yourself or your garage, without special tools. 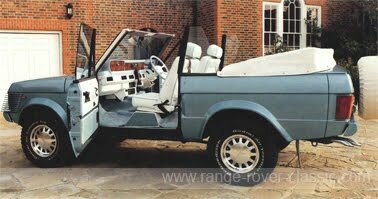 The full convertible feeling for your Range Rover: 1.66 m x 1.20 m outdoor experience! We are the exclusive importer for SUNSEEKER folding sliding roofs for the continent. The electric sunroof is in a matter of seconds by pressing a button or fully closed position, hardly a convertible offers this convenience! 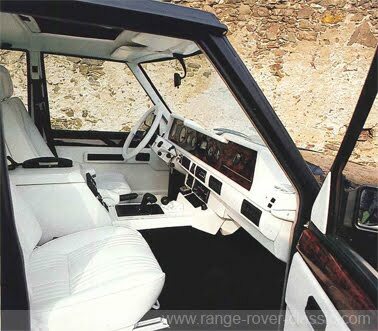 The padded inner lining of SUNSEEKER folding sunroof is covered with the same fabric as the original roof lining of the Range Rover. 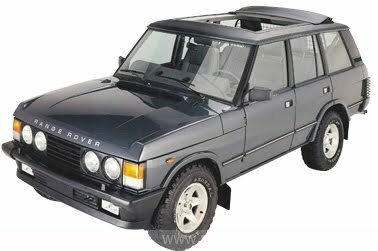 subsequently, the roof is easy to install in any Range Rover - regardless of model year. Electric WEBASTO steel sunroof with mechanism of clever design, as a complete second roof panel made ​​of fiberglass reinforced polyester in vinyl structure, the roof is easily in care, scratch and impact resistant. The roof inner lining is not different from the original reference. 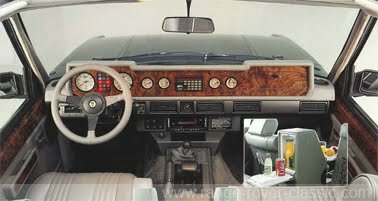 Dashboard, VDO instruments 100 mm and 60 mm diameter, (tachometer, speedometer, trip counter, voltmeter, oil pressure gauge, temperature gauge, fuel gauge), in Connolly leather and furnished with wood in walnut natural. Available with cut-out for the telephone display. as before, walnut reddish related to all parts of the dashboard and with Connolly leather. All parts of the instrument panel with Connolly leather. 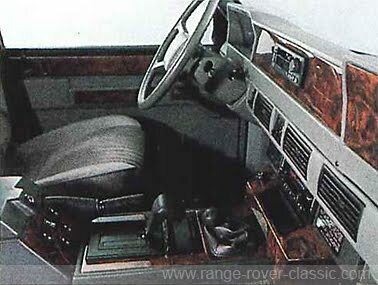 Radio surrounding (from '86 model), gear lever / sleeve and center console with Connolly leather. Sun visors with Connolly leather. As above, with right sun visor lighted makeup mirror system (Mercedes). Connolly leather head lining and related parts (without sunroof). As above, in connection with sliding sun roof. Stiles (A, B, and C posts) covered with Connolly leather. Rear deck, spare tire cover and D-pillar trim with Connolly leather and a matching carpet. Seating featured in Connolly leather (optional piping in contrasting color). Electric seat-adjustment of front seats (from Mercedes S-Class). As above, with memory function. Connolly leather door panels (optional piping in contrasting color). All plastic parts (seat facings consoles, steering column trim, air vents, etc.) painted to match the Connolly leather. Moto Lita leather steering wheel, black. Moto Lita Connolly leather light gray. Moto Lita Connolly leather to match interior. Door wood capping walnut, nature. Door wood capping walnut, reddish. Radio compartment, gear lever and switch panel customized new aluminum veneer with natural root walnut, glove box lid massive wood walnut natural root. Connolly leather, box lid as armrest. As above, box lid with built in mobile phone (B-and C-Net). Carpet made ​​of high quality velour, color of your choice, on demand with contrasting borders. Luggage compartment lining according to RR27. Customized, new center console with integrated TV color-monitor, in Connolly leather trim. Front loading video recorder on the storage in the front passenger leg room (vehicles without air conditioning). As above, Video Recorder in the right side panel of the luggage compartment, to be served from the back seat. with glass cover (of course with sun visor). 25 I extra fuel tank (mounted in the right rear fender, filled with original fuel filler neck) a Fischer cassette. Black velour carpet. Wide tire kit 275/60 ​​R 15 to 9 x 15 CW rims, color-keyed and primed wing widenings, 4-fold. Wide Tire Kit 9,50 R 15 to 7 x 15 CW rims, body-color painted and bolted fender flares, 4-fold. RS-black bull bar so any noise or slosh is avoided. RR 60 of capacity of 10 ltr pr 1 cm height. (absolutely no up-swing tilt of the vehicle in fast S-shaped curves). Very good comfort. 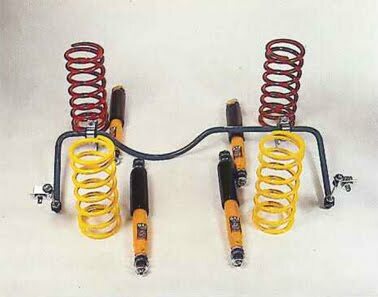 According to our customers the best suspension that are available for the Range Rover. 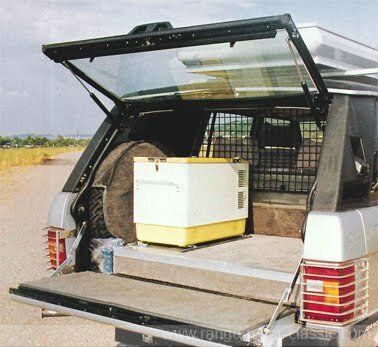 Extending the wheelbase by 23 cm in the rear doors. Royal space in the rear. fully to the back of vehicle(190 cm total without down-folded rear seats). Indoor facilities based on the series Vogue equipment. 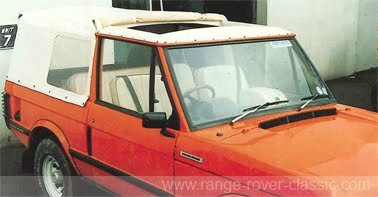 Vinyl roof cover as standard. As above, but with mechanically switchable drive for 3rd axle. performance through careful tuning and 70 mm tube diameter will successfully work excellent. larger valve, the power increases on this carburettor engine to about 170 hp. 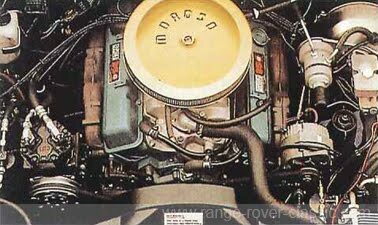 The torque is 31% higher at 2000 rpm, at 3000 rpm 37% higher than the standard engine. 12 month warranty with unlimited mileage. 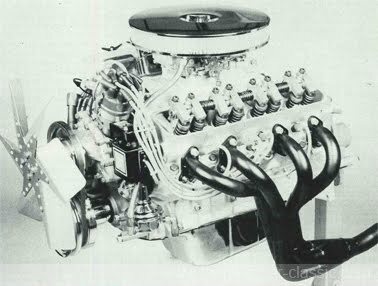 430 HE engine, based on series engine block. in a displacement capacity of 4,290 cc. Power: 237 hp DIN at 5250 rpm. Top speed close to 200 kmh. for more power ,up and out '! 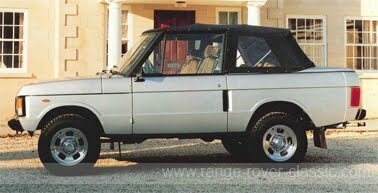 (only 70 kg heavier than the 3.5-liter Range Rover engine) is known for its powerful torque. 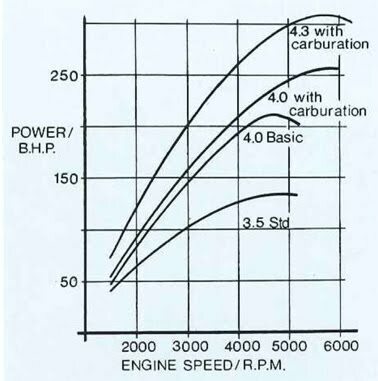 We use the model that was installed in the '82 Corvette with 210 DIN hp. package an excellent results with 100% reliability and a minimum of maintenance. viscous slip differential and a torque distribution of 37/63% to front / rear axle. (70 mm diameter), oil cooler, sport suspension. 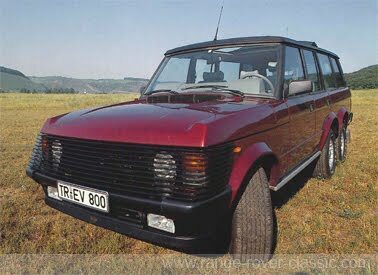 RR 83 conversions during the 70's, 80's and 90's. Impressive! 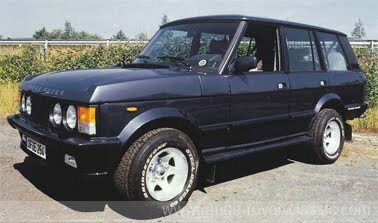 Canvas top, simple and inexpensive way to drive a 2-door Range Rover open.